Many years ago we discovered portraits in oil of the parents of Kirke White, which are still in our possession. 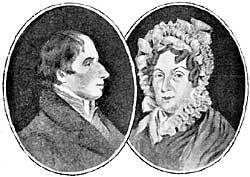 They were painted by the eminent Nottingham portrait painter, Barber; who also produced the best known portrait of the Poet. WHEN young White was contemplating an University career, Messrs. Coldham & Enfield, "his employers, gave him a month's leave of absence for the benefit of uninterrupted study, and a change of air, which his health now began to require. Instead of going to the sea-coast, as was expected, he chose for his retreat the village of Wilford. In this village his mother procured lodgings for him, and his place of retreat was kept secret, except from his nearest friends"—to quote Southey. He frequently stayed at the house on the river-side nearest the church, which is known as "The Manor House," long occupied by Mr. George Smith. Beneath this yew I would be sepulchred. Young White died, it will be remembered, at St. John's College, Cambridge, and was buried in All Saint's Churchyard, on October 24th, 1806. Some of White's lines on "Childhood," of one of his earliest efforts, is excellently descriptive of village life and country scenes; not the least portion is that of the village dame and the village green. His poem "On being confined to school one pleasant morning in Spring," was very likely written at Wilford. 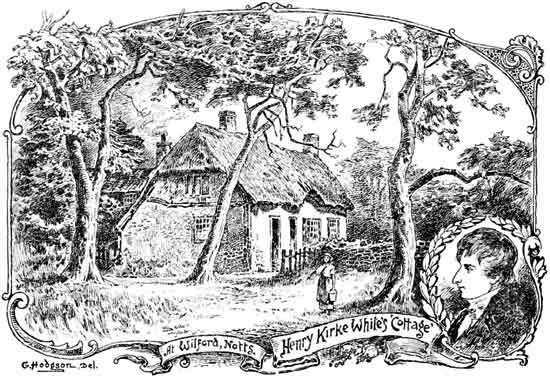 During 1804 White wrote a letter to his brother Neville, in which he said he was in "a little cottage at Wilford, where I have taken a room for a fortnight, as well for the benefit of my health, as for the advantage of uninterrupted study. 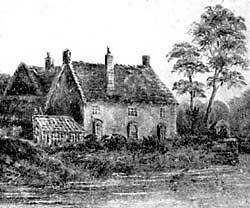 I live in a homely house, in a homely style, but am well occupied, and perfectly at my ease," (see full page illustration); and in the same year he wrote from Wilford, to the same brother, stating that he had "sent copies round to such persons as had given me in their names as subscribers, with compliments, they have placed them to the account of presents!" this referred to his little volume, "Clifton Grove." This "homely house" was adjacent to the School, and is now demolished.